Car Seat Signs by Cold Snap Studio: What's Wrong with Max? 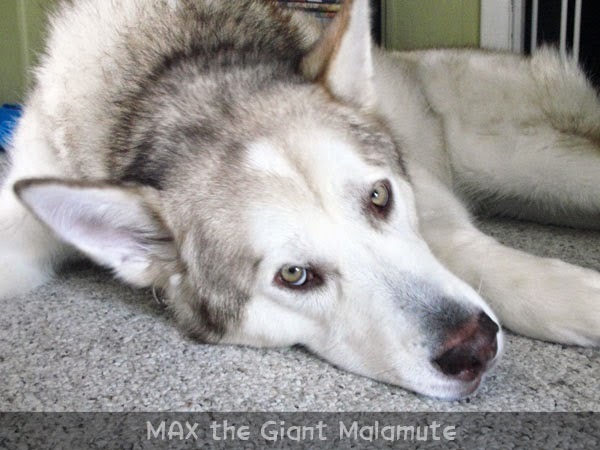 As many of you know, I have a Giant Alaskan Malamute named Max. Something very odd has gotten into poor Max recently. At the ripe old age of 2 and 1/2, he is exhibiting some very strange behavior. - Stopped eating socks. STOPPED EATING SOCKS!!! - Taking orders from my 2-year-old. Sometimes even before he takes orders from me. - Sniffing things and leaving them alone. Well, except for moose. - Super affectionate "good boy". Like I said, very odd behavior. I'm almost worried. Almost. I'm not entirely worried because he still steals my popcorn, so I know it's still "him" in that big goofy head of his. He hasn't been abducted by aliens or anything. Whew!